High-resolution images for editorial coverage, press release and fact sheet for The Arsenal of Democracy. Click on an image below to download a high resolution file. Don’t see the image you are looking for? Contact us with your specific request. Please specify your publication and deadline. Please credit all images "Courtesy of The National WWII Museum." 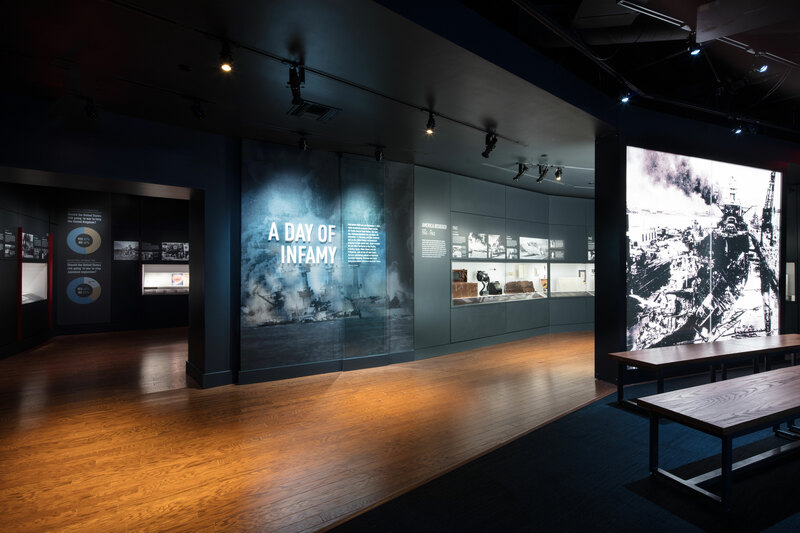 The National WWII Museum’s original home—housing The National D-Day Museum in its entirety on opening day, June 6, 2000—Louisiana Memorial Pavilion is now where the visitor experience launches through five soaring pavilions across our six-acre campus. 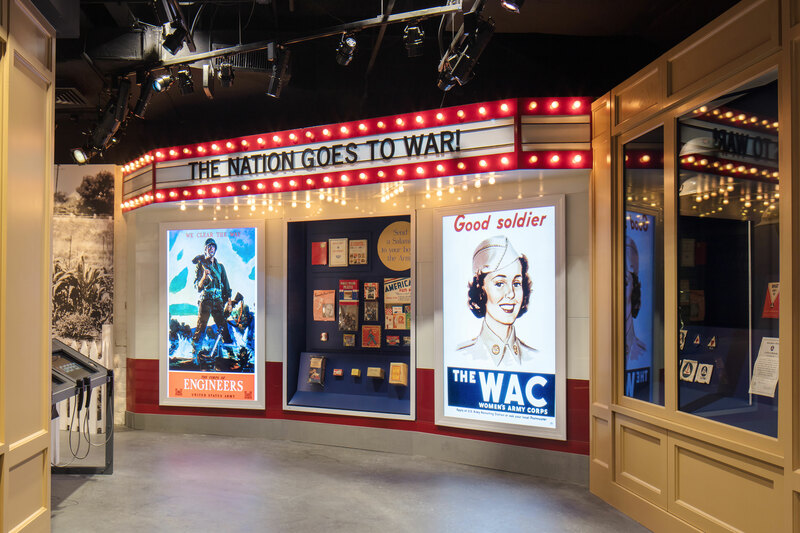 In June 2017, its second level became home to the Museum’s newest permanent exhibit, The Arsenal of Democracy: The Herman and George R. Brown Salute to the Home Front, an exploration of the road to war and how victory was achieved via stateside ingenuity and industry. 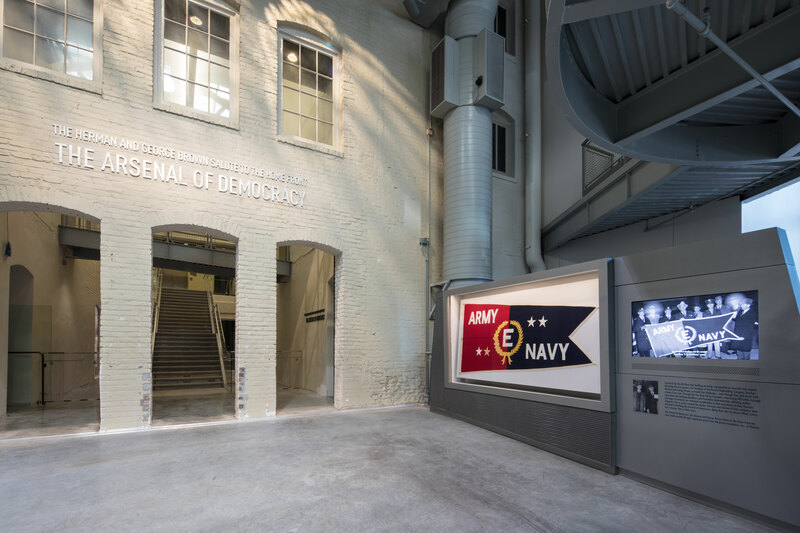 On the second floor of the Museum’s original Louisiana Memorial Pavilion, the entryway to The Arsenal of Democracy: The Herman and George R. Brown Salute to the Home Front features a video presentation and striking “E for Excellence” flag awarded to Houston’s Brown Shipbuilding Company by Secretary of the Navy Frank Knox for the company’s wartime production of more than 350 warships. 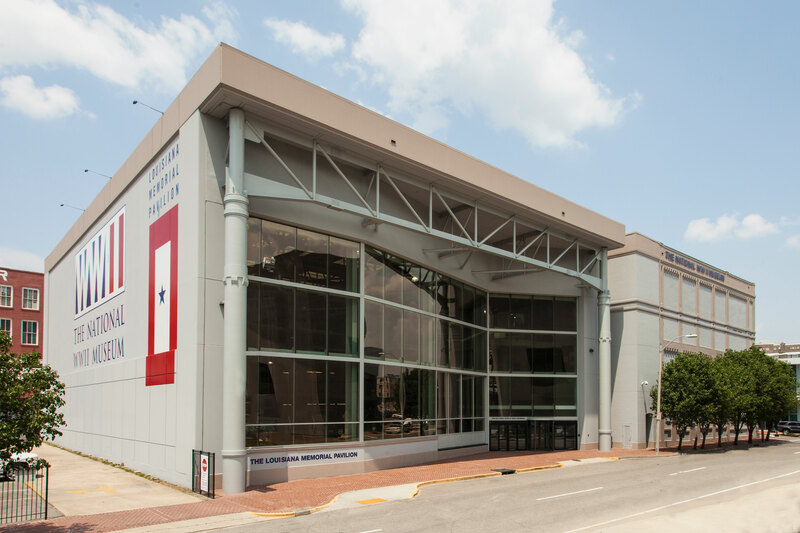 The National WWII Museum is grateful for the continued support of The Brown Foundation, Inc., of Houston. 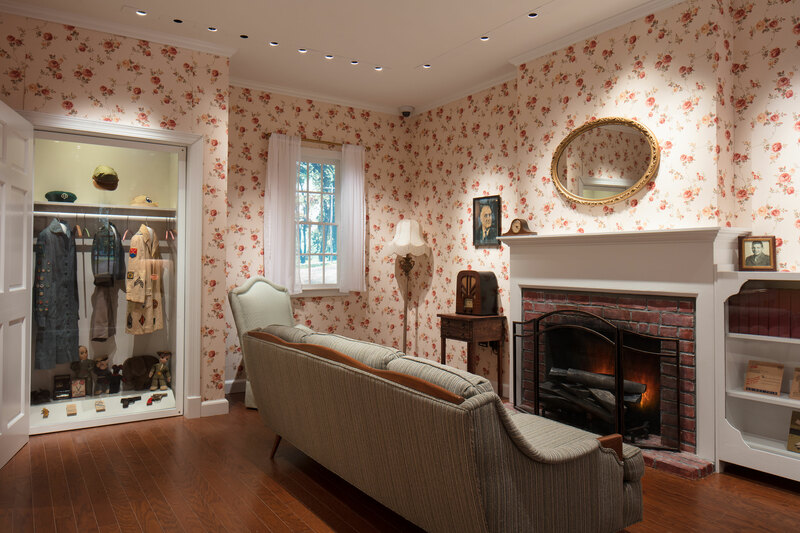 The Gathering Storm gallery covers the historical events that preceded the outbreak of World War II, from the world left behind by World War I to the 1920s rise of fascism to the surging German and Japanese aggression in the 1930s. Americans held tightly to isolationist policies against the growing global unrest, only to find themselves poorly prepared to confront the Axis powers. A debate between isolationists and interventionists gripped America from the outbreak of World War II in Europe until the attack on Pearl Harbor in 1941. 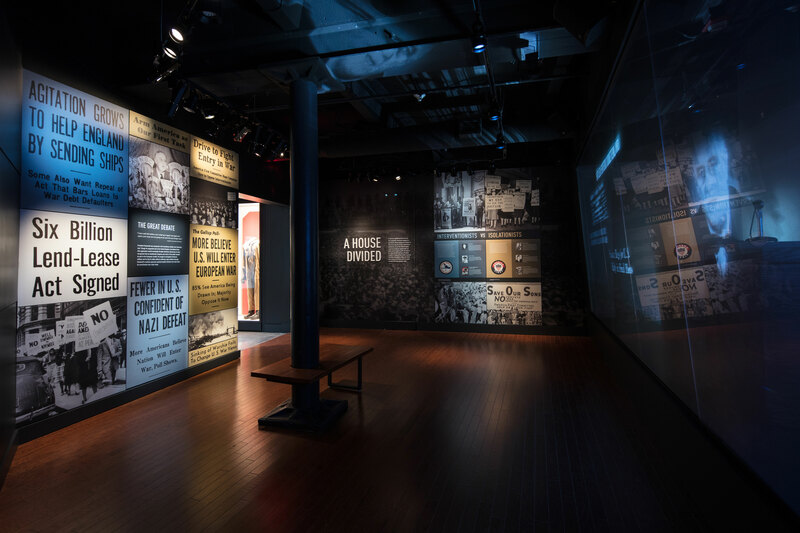 Through a special multimedia presentation featuring the images and sounds of conflicting voices engaged in that debate, this gallery immerses visitors in the atmosphere of anxiety that defined an American society passionately hoping that peace would endure, but beginning to acknowledge that war may be unavoidable. 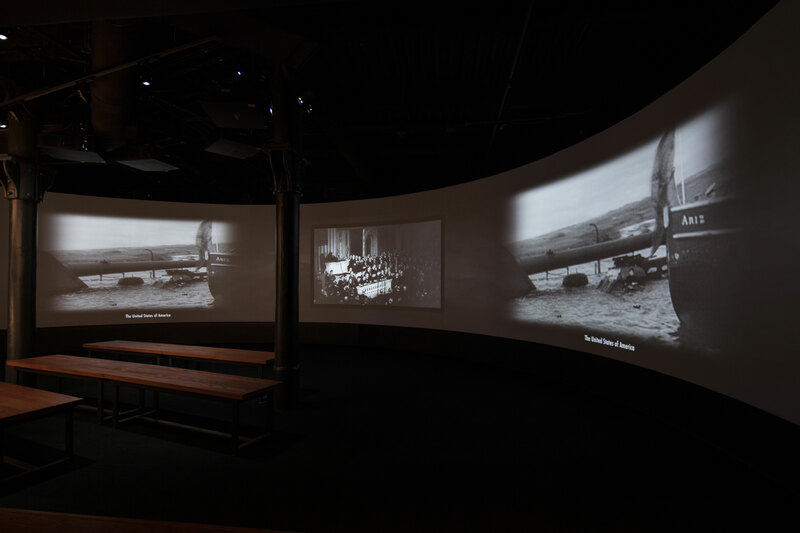 A 50-foot-wide projection screen displays the shock and chaos of Pearl Harbor on the morning of December 7, 1941, and sets the stage for the dark early months of America’s entry into global conflict. America’s national morale remained unbroken, however, as the unity of purpose on the American Home Front would become the backbone of a national war effort in which every man, woman, and child would contribute. As the United States entered World War II, enlistments in the military soared as the nation rallied around the war effort. 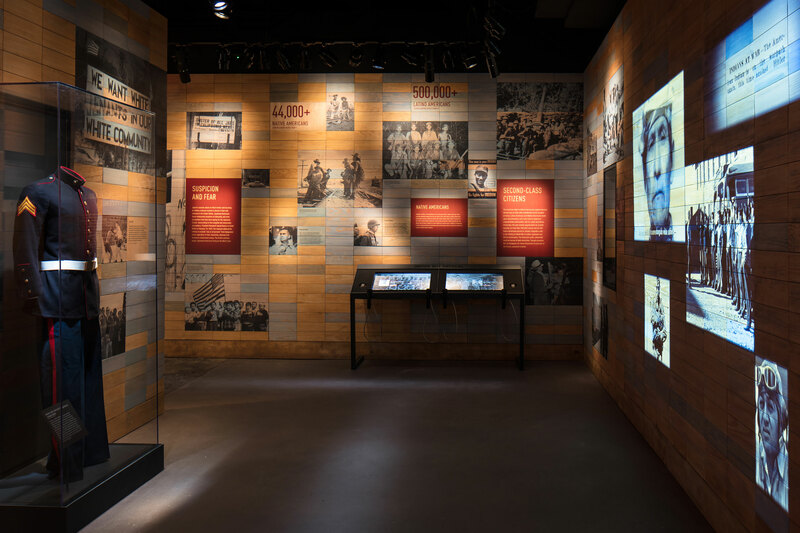 The America Responds gallery conveys how the onset of World War II unified the country, and demonstrates how war news was witnessed on every Main Street. 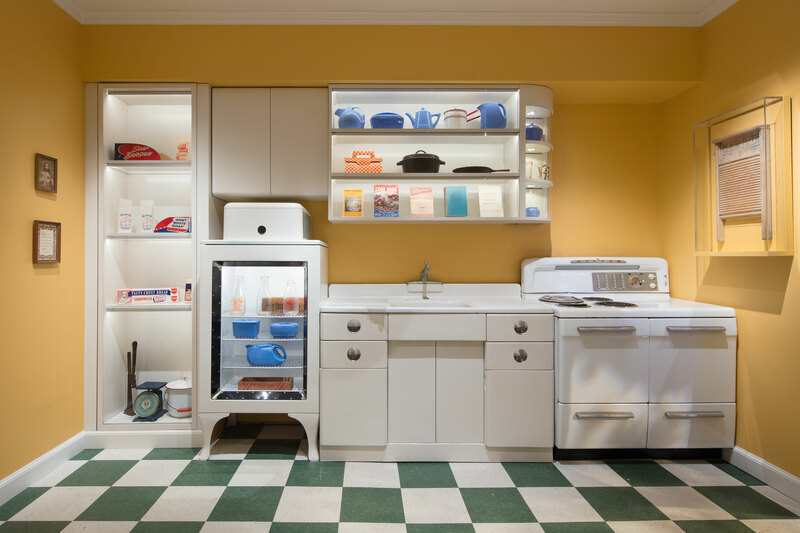 The gallery immerses visitors in a 1942-style home to convey a sense of the daily lives of American families during World War II, as those on the Home Front adjusted to rationing and shortages of consumer goods, fuels, and food items. Women not only handled these issues in the home, but took on new employment, while children and the elderly contributed through Victory Gardens, bond purchases, and scrap drives. 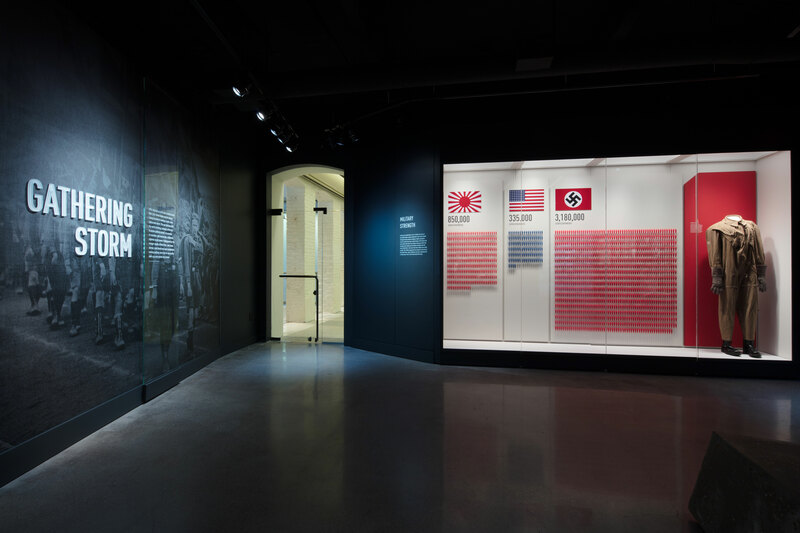 While the cause of victory over the Axis powers united Americans, the racial supremacy championed by the Axis powers also refracted light on issues of national loyalty and race in America, exposing tensions which could not be ignored. 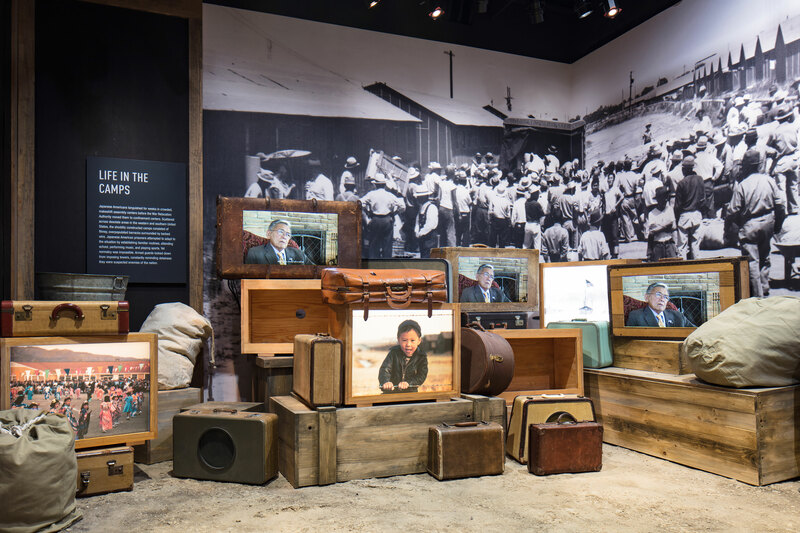 While German Americans and Italian Americans were not identified as potential threats, Japanese Americans were most dramatically singled out in the wake of Pearl Harbor for intense suspicion, contempt, and ultimately mass incarceration. 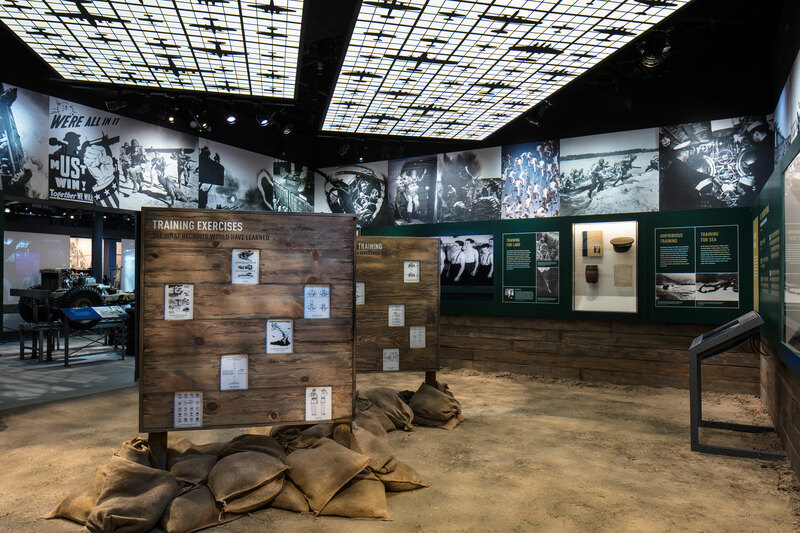 Set in a military barracks environment, this gallery highlights the massive effort to rapidly train and mobilize millions of civilians to become the nation’s troops in combat zones around the world. 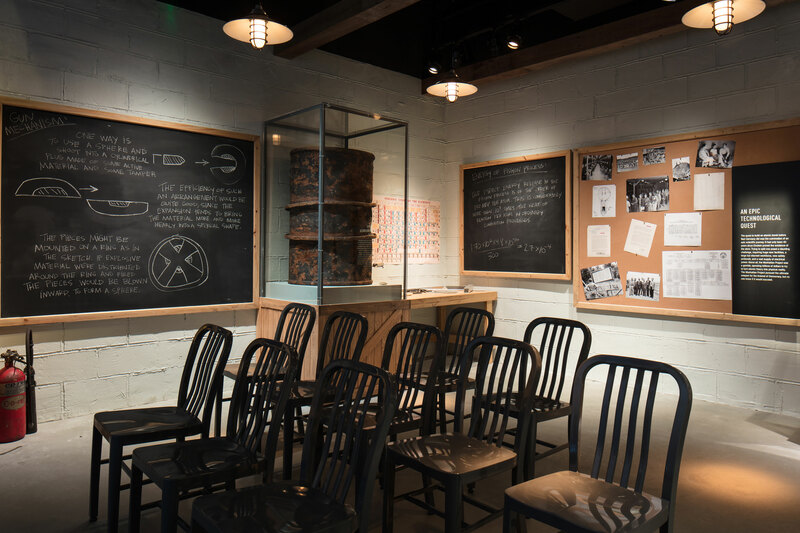 But not all citizen soldiers’ experiences were alike: women, African Americans, and Japanese Americans all served in segregated units. Once the United States entered the war, the American economy mobilized and dramatically transformed into what President Franklin Delano Roosevelt called “the Arsenal of Democracy,” spearheading the Allied drive to victory. 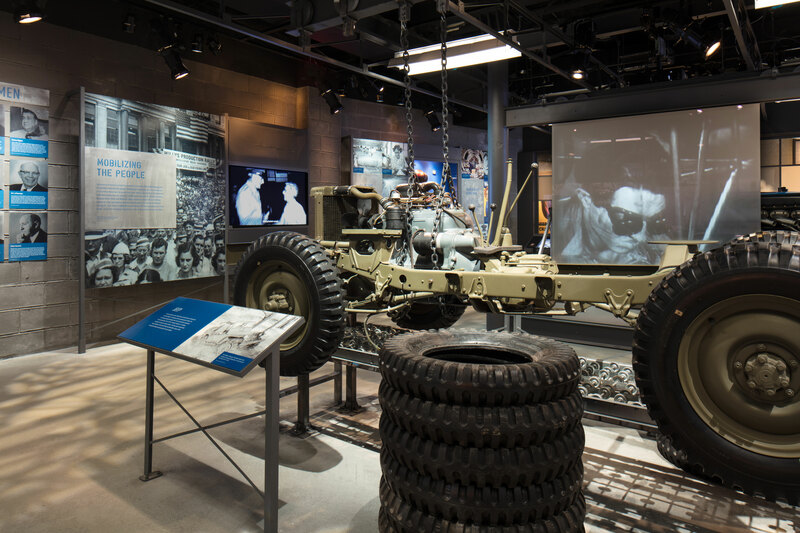 American industry poured out weapons and war matériel in staggering amounts, and used scientific and technological innovation to beat our enemies in quality as well as quantity of equipment—a triumph represented by a jeep assembly line running through the center of the gallery. Far away from public sight, the most consequential scientific innovation during World War II was the creation of the atomic bomb through the top-secret Manhattan Project. 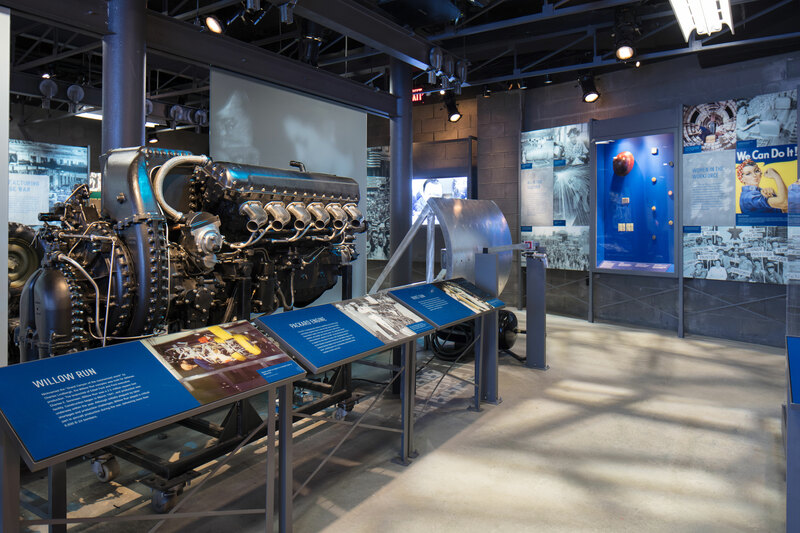 This gallery highlights one of the largest mobilization stories in the war, engaging visitors in a Los Alamos environment while detailing the massive scientific, technological, and military effort that ushered in the Atomic Age.